Welcome Summoners, This Nemesis Draft Tier List will help you draft the weakest champions for your enemy. The Best & Worst Nemesis Champions available in League of Legends currently. With this rotating game mode tier list, we are going to flip it on its head. Meaning now the Worst Nemesis Draft Champions = The Best Nemesis Draft Champions to give your opponents. In Nemesis Draft, everyone picks a champion for the opposing team, and each team gives their opponents champions from their team’s combined champion pool. Nemesis Tier List of the Best & Worst Champion Picks available in the Nemesis Draft Game Mode. 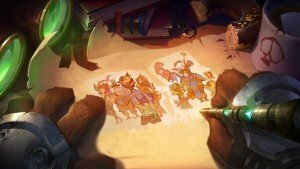 Ranked from S-Tier having the Strongest Champions, while F-Tier will host some of the Weakest. These are the Worst Nemesis Draft Champions available in League. Champions like Mordkaiser has been for a long time one of the worst champions in league of legends. He is ranked among the highest regarding the worst nemesis draft champions. Other champions like Kogmaw, who take the time to scale into late game and struggle lane phase are also some of the worst nemesis champions. It’s a simple one and can be effective if the enemy team does decide to not use the jungle. As long as you don’t pick any type of jungle champion the enemy team will not be able to jungle. This means you will get more jungle camps to clear, or at the very least you will verse a weak enemy jungler. If the enemy team only has one type of damage wither its AD or AP. Your team will be able to itemize a lot easier in game.